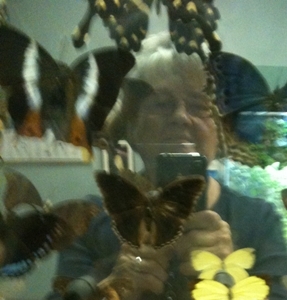 Except for a few mounted in the exhibit room, butterflies fly free at the Magic Wings Butterfly Conservatory and Museum, where I assisted with the nursing home folks who went on the field trip today. The Conservatory is pretty much an indoor recreation of a tropical environment, with baby quail running around through the ground cover and an occasional bird shrieking from some sheltered niche. Of course, I tried to take some photos, which, also, of course, can’t come close to the ones in the web site’s online gallery. 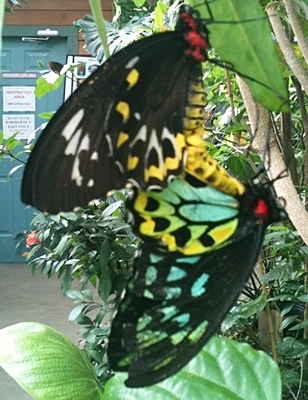 But I did get a shot that they don’t seem to have: a pair of butterflies mating. They were in that position when we got there, and they were still in that position when we left. 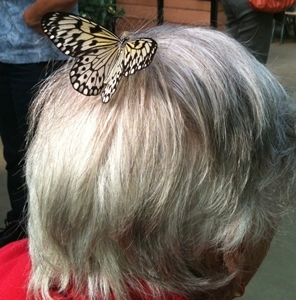 This entry was posted in aging, animals and pets, getting older, learning, volunteering by Elaine. Bookmark the permalink.